I am researching an article about this daffodil which was recorded as being common in throughout UK in 1600 and was still widespread in 1930. Does anyone know of extant colonies in old gardens, cemeteries, woodlands etc. It seems to have disappeared from our gardens or hopefully just fallen below the radar. 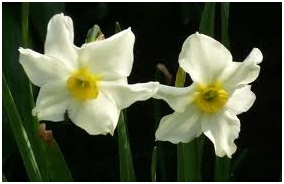 It flowers in April with 1 – 3 but usually 2 small white flowers on a tall stem with small yellow cups. The perianth segments are often distorted. It is scented. The other mystery is where the cross could have occurred (it is tazetta x poeticus) Does anyone know where these 2 daffodils grow together in the wild? This entry was posted in Enquiries, Historic Daffodils. Bookmark the permalink.